Bangkok Don Mueang saw passenger traffic surge by 50% in 1H2015, enabling it to become the world’s largest LCC airport. Don Mueang has overtaken Kuala Lumpur International (KLIA), which was until recently Asia’s largest LCC airport, as well European LCC airport leader Barcelona El Prat and North American LCC airport leader Las Vegas McCarran. Don Mueang is unlikely to relinquish its new title as Thailand’s three main LCC groups continue to pursue rapid expansion. Thailand’s LCC fleet is expected to surpass 100 aircraft by the end of 2015. Thailand’s LCC sector currently consists of 87 aircraft, up from 74 aircraft at the end of 2014. All but seven of these aircraft are based at Don Mueang. Don Mueang Airport handled 14.4 million passengers in 1H2015, representing a staggering 50% increase compared to 1H2014, according to newly released data from Airports of Thailand. LCC passenger traffic at Don Mueang increased by 44% from 9.3 million in 1H2014 to 13.4 million in 1H2015. Growth has accelerated from an already very fast clip in 2014. Don Mueang saw total passenger traffic grow by 31% in 2014 to 21.5 million, including a 32% increase in LCC passenger traffic to 20.6 million. In 2013 Don Mueang had 15.7 million LCC passengers for the full year, making it roughly the 20th largest LCC airport in the world. The 13.4 million passengers handled in 1H2015 make Don Mueang the largest, based on CAPA estimates. Las Vegas McCarran handled 13.3 million LCC passengers in 1H2015. McCarran does not provide an LCC breakdown but an LCC figure can be calculated as it provides a monthly traffic breakdown for every airline that serves Las Vegas. The LCC figures for the other airports in the above chart are not exact but it is almost certain that none exceeded 13 million. The sixth largest LCC airport based on current seat capacity is London Gatwick, which handled an estimated 11 million LCC passengers in 1H2015. Denver International Airport also handled about 11 million LCC passengers in 1H2015. Barcelona El Prat Airport reported passenger traffic of 18.064 million for 1H2015 but does not provide an LCC breakdown. For Barcelona to match the 13.4 million LCC passengers it would have needed a virtually impossible LCC penetration rate of 74%. According to Spanish tourism ministry data, LCCs accounted for 63% of arriving passengers at Barcelona El Prat in 1H2015. For CAPA’s estimate of 12 million passengers an LCC penetration rate of 66% is used. Based on schedules for the current week, Barcelona El Prat has slightly more LCC seats than Don Mueang, followed by KLIA, Jakarta Soekarno-Hatta and Las Vegas McCarran. But CAPA and OAG capacity data shows Barcelona at the top only temporarily. The northern summer is a peak period for Barcelona but an off-peak period for Bangkok. Sign up for the CAPA LCC Airports Congress: Bangkok, 15-Sep-2015. For details on the Congress, including the agenda, click here. The Kuala Lumpur International Airport (KLIA) figure of 12.6 million passengers is based on the 12.32 million passengers handled by new hybrid terminal KLIA2 in 1H2015 (according to data from Malaysia Airports) plus an estimated 250,000 LCC passengers for the main terminal. KLIA2, which opened in May-2014, is currently used by all LCCs serving Kuala Lumpur except Air India Express, which operates only four weekly flights to Kuala Lumpur. But Jetstar Asia only moved to KLIA2 on 8-Jul-2015 and therefore its traffic was not included in the 1H2015 figure for KLIA2. Jetstar Asia carried 488,000 passengers to and from Kuala Lumpur in 2014, according to Malaysia Airports data. Malaysia Airports reported a 2% reduction in total passenger traffic for KLIA in 1H2015 to 24.1 million. LCC traffic likely still grew, but modestly, enabling Don Mueang to jump past KLIA with its 44% LCC growth rate. To put the two markets in perspective, there are currently 87 LCC aircraft based at KLIA, compared to 86 aircraft at the beginning of 2015. At Don Mueang the number of LCC aircraft has increased from 68 aircraft at the beginning of 2015 to 80 aircraft currently. Market conditions in Malaysia have been more challenging, prompting Southeast Asia’s largest LCC groups AirAsia and Lion to focus more on Thailand. AirAsia and Lion have also been pursuing faster growth in Thailand than in Indonesia, another country where both groups have subsidiaries or affiliates. The Lion Air and Indonesia AirAsia fleets were flat in 1H2015 while the third main LCC player in Indonesia, Garuda subsidiary Citilink, saw modest fleet growth. Growth has particularly slowed at the capital Jakarta, where slot constraints make it difficult to expand. Jakarta Soekarno-Hatta reported a reduction in total passenger traffic for both 2014 and so far in 2015. The CAPA estimate for Jakarta LCC passenger traffic is based on the airport’s approximately 45% LCC penetration rate. Don Mueang is still a much smaller airport overall. Don Mueang was only Southeast Asia’s seventh largest airport in 2014, behind Jakarta, Singapore, KLIA, Bangkok Suvarnabhumi, Manila and Ho Chi Minh. But Don Mueang is unique in that it is dedicated almost entirely to LCCs. In 1H2015 LCCs accounted for 92.7% of Don Mueang’s total passenger traffic but only 10.5% of total passenger traffic at Suvarnabhumi, according to Airports of Thailand data. Don Mueang is currently served by 12 LCCs, including four AirAsia-branded carriers. Thai Airways full-service regional subsidiary Thai Smile, Maldivian (the only foreign FSC at Don Mueang) and several Thailand-based leisure carriers account for the 7% of passenger traffic not flown by the LCCs. Thailand initially forced all airlines to move from Don Mueang to Suvarnabhumi when Suvarnabhumi opened in 2006 but quickly changed its one-airport policy for Bangkok and reopened Don Mueang in 2007. Don Mueang is located about 28km north of central Bangkok while Suvarnabhumi is about 32km to the east. Nok Air was the primary tenant of Don Mueang until Oct-2012, when the AirAsia Group moved its Bangkok operation from Suvarnabhumi. AirAsia drove nearly a tripling of Don Mueang passenger numbers in 2013. AirAsia-branded carriers currently account for nearly half of total seat capacity at Don Mueang. Don Mueang was also closed entirely from late Oct-2011 to early Mar-2012 due to flooding, forcing Nok Air to temporarily move its operations to Suvarnabhumi. This further distorts the growth figure from 2013. Unlike the growth in 2013, the growth in 2014 and 1H2015 was driven almost entirely by expansion rather than airlines moving over from Suvarnabhumi. As CAPA has previously highlighted, Thai Lion Air launched services at the end of 2013 with a base at Don Mueang and has since pursued rapid expansion. Nok Air and Thai AirAsia responded by further accelerating expansion. Nok and AirAsia also have expanded by launching new Bangkok-based long-haul LCC joint ventures, NokScoot and Thai AirAsia X. 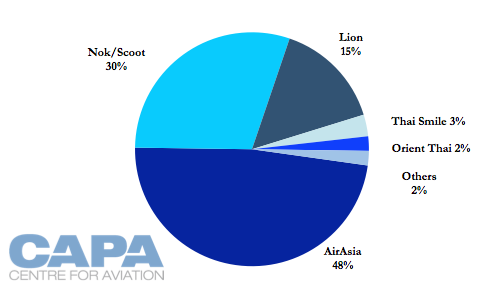 The AirAsia, Nok and Lion groups combined now account for 93% of scheduled seat capacity at Don Mueang. Notes: Thai Smile is a fully owned subsidiary of Thai Airways. Hong Kong Express launched services to Don Mueang on 20-Jul-2015, becoming the twelfth LCC (and seventh foreign LCC) to serve the airport. Malaysia AirAsia and Thai AirAsia moved to Don Mueang alongside Thai AirAsia in Oct-2012, becoming the first foreign LCCs to serve Don Mueang. Suvarnabhumi is still served by 15 LCCs, including two long-haul LCCs, but none operate more than six daily flights. Thai VietJet is the only Thai-based LCC operating from Suvarnabhumi but is not included in the chart below as it is currently only operating charters and has not yet begun scheduled services. While new operators such as Scoot and Thai Smile contributed to some of the passenger growth recorded by Don Mueang over the last year the overwhelming majority of the growth was generated by the Thai-based LCCs. The five LCCs currently based at Don Mueang account for about 86% of total seat capacity at the airport. This group of five LCCs currently operates a fleet of 86 aircraft, including 80 aircraft which are based at Don Mueang. Only Thai AirAsia has other bases, with six of its 43 A320s spread across secondary bases at Chiang Mai, Krabi and Phuket. As outlined earlier in this report, the Don Mueang-based LCC fleet grew from 68 to 80 aircraft in 1H2015. The Don Mueang-based LCC fleet is expected to grow by another 16 aircraft in 2H2015, reaching 96 aircraft. 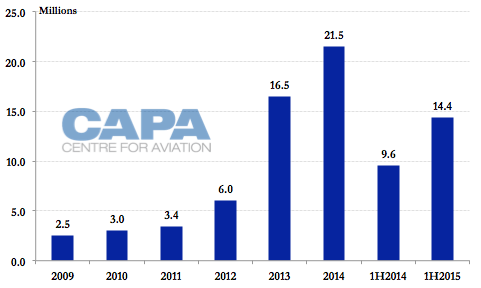 This would result in an annual growth rate of over 40% for 2015 - not surprising given the recent rapid traffic growth at Don Mueang and once again indicating that the growth has been driven primarily by local carriers. The total LCC fleet in Thailand is projected to reach 105 aircraft at the end of 2015, when also including the Thai AirAsia aircraft based outside Bangkok and the initial fleet of Suvarnabhumi-based Thai VietJet. Thailand’s LCC fleet has more than doubled since the beginning of 2013. The further growth of Thailand’s LCC fleet anticipated for 2H2015 should lead to continued rapid passenger growth at Don Mueang, enabling the airport to maintain its new status as world’s largest LCC airport. While Thailand’s LCCs will also launch some new point-to-point routes that bypass Bangkok, Don Mueang should capture most of the upcoming growth. Don Mueang currently accounts for about 88% of Thai AirAsia’s total seat capacity, 98% for Thai Lion, 99% for Nok and all the initial capacity for Thai AirAsia X and NokScoot. Start-up Thai VietJet is based at Suvarnabhumi but is not expected to be a significant player. Don Mueang has plenty of capacity to accommodate further growth as it is still operating well below the levels it was at before Suvarnabhumi opened in 2006. Bangkok in this respect has a huge advantage over other Southeast Asian cities, particularly Manila and Jakarta where capacity constraints are blocking further LCC growth. Don Mueang has evolved into becoming essentially an LCC facility. It also has quickly but quietly emerged as the largest LCC airport in the world, perhaps providing some lessons for other airports seeking to raise their LCC status. Bangkok, appropriately, is the site of the inaugural CAPA LCC Airport Congress, which will be held on 15-Sep-2015. Bangkok Don Mueang operator Airports of Thailand is sponsoring the one-day event. For details on the Congress, including the agenda, click here.